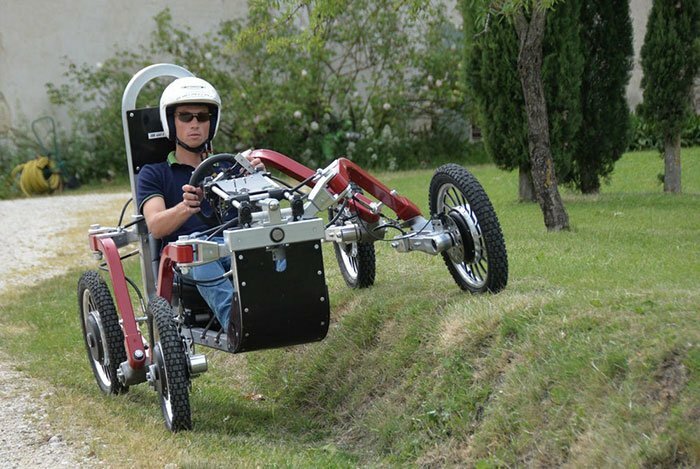 Swincar's independent suspension keeps the driver upright even on very bizarre terrain. The diverse landscapes on Earth are incredible, strange yet bizarre at times. We are surrounded by beautiful places that we want to explore. Often, finding an appropriate automobile to take us there and help us explore is not an easy task. We may refrain from exploring certain regions due to the complexity that comes with traversing them. Trekking while carrying gear is not for the faint-hearted. To conquer terrains with narrow passages, uneven surfaces, thick undergrowth and low overhanging branches of flora, we need a tool that will serve us optimally. We need a new way of driving, one friendly in all variations that the environment has to offer. This tool should surmount sand and snow, the hills and valleys. It should let us enjoy the wind in the grass, nature’s rustling, the insects and birds. The SWINCAR e-Spider is all that and then some more. This is the perfect tool, optimized for triumphing over all terrain. Surprisingly, it is gentle and glides easily over the surface of the Earth. It is incredibly agile, easy and safe, yet hugely enjoyable. 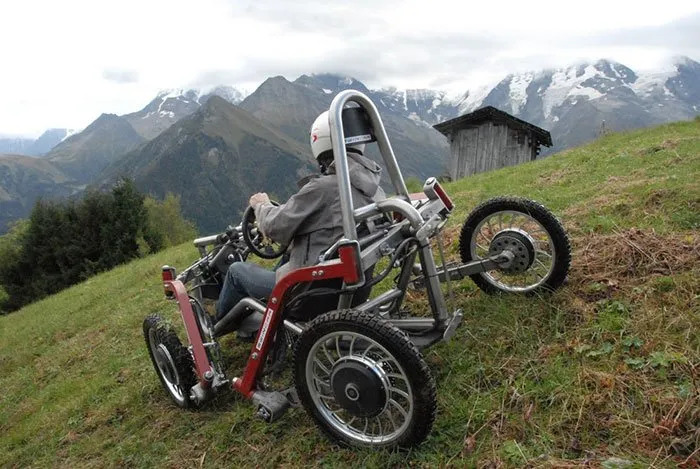 The SWINCAR features powerful quiet electric motors that juice this tilting 4-wheeler concept. The motors are installed on each individual wheel. Each wheel is suspended separately on a spider-like limb. This automobile takes turns exquisitely, just as a motorcycle leans into them and can briskly ascend or descend nerve-chilling gradients of up to 70 percent. You get to ride across a 50 percent incline that raises the right wheels several inches higher than those on the left. Swincar is capable of handling a 70% slope head on, and traveling across a 50% slope sideways. The SWINCAR can handle huge ruts and extreme gradients with mind-blowing ease. Sporting hydraulically-assisted all-wheel steering and braking, it is swift and nimble to turn, giving each wheel a degree of litheness to deal with rutted conditions. Each motor, either 1 or 1.5 kW, is powered by a battery pack under the driver’s legs. In comparison with the average ATV, this vehicle is low-powered. However, moving to larger batteries and more powerful motors wouldn’t be problematic. Hands down, this a fantastically unique and zero-emission recreational vehicle concept. Seems it is more or less ready to be produced. The SWINCAR team is planning a version with joystick steering that might suit physically impaired riders. This is a rare device, and it would be so much fun driving on all surfaces. We can’t wait for it to swing into full-scale production for us to take a ride on one. Let me know when they become available .